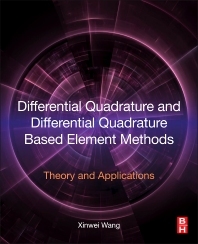 Differential Quadrature and Differential Quadrature Based Element Methods: Theory and Applications is a comprehensive guide to these methods and their various applications in recent years. Due to the attractive features of rapid convergence, high accuracy, and computational efficiency, the differential quadrature method and its based element methods are increasingly being used to study problems in the area of structural mechanics, such as static, buckling and vibration problems of composite structures and functional material structures. This book covers new developments and their applications in detail, with accompanying FORTRAN and MATLAB programs to help you overcome difficult programming challenges. It summarises the variety of different quadrature formulations that can be found by varying the degree of polynomials, the treatment of boundary conditions and employing regular or irregular grid points, to help you choose the correct method for solving practical problems. Structural engineers, computational engineers, practicing engineers, graduate students majoring in engineering, researchers in transport processes, fluid mechanics, static and dynamic structural mechanics, static aero-elasticity, and lubrication mechanics. Professor at Nanjing University of Aeronautics and Astronautics in China since 1993, Dr. Wang earned his MS degree in solid mechanics from the same university, and his PhD in mechanical engineering from the University of Oklahoma, USA. Prof. Wang has been a visiting scholar at the University of Michigan at Dearborn, the University of Maryland at Baltimore County, the University of Oklahoma and the University of California at Los Angeles. He has published over 200 papers in the areas of numerical methods and computational engineering, mechanics of composite materials and experimental finite plasticity, with over 50 of these related to the differential quadrature method. Nanjing University of Aeronautics and Astronautics, China.